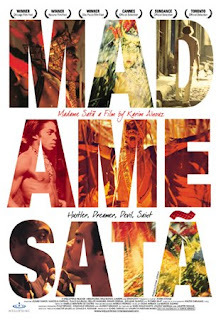 Madame Sata tells the life story of Jaoa Francisco dos Santos , an historic figure in Brazilian counterculture. Known to his followers and friends as Madame Sata, which is his stage name in the haunting narrative performances he gives dressed in drag, Joao is paterfamilias to a bizarre group of street urchins that reside in his apartment as his surrogate family. Set in 1932 in the rowdy ghetto of Rio de Janeiro called Lapa, the film presents Jaoa as a near-mythic persona who is in turns a hustler, a criminal, a street fighter, a murderer, and above all, a hero.